I originally began a Fox Watch! 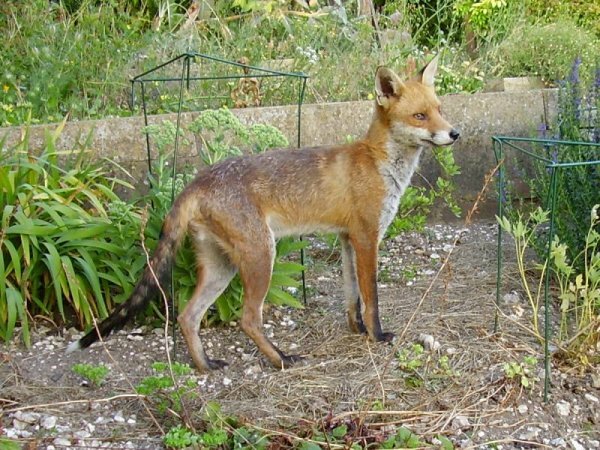 section of this website back in 2005 as a means of documenting the foxes who were visiting our garden. Up until then I’d rarely, if ever, seen a fox but I quickly realized that this was down to my lack of seeing rather than any shortage of urban (or semi-urban) foxes. The early photos were taken on a very basic point-and-shoot camera (1.7 megapixel), less powerful than most modern phones but enough to give me the camera bug. The photo on the left is one of my very first photos, from a distance (and with flash). It may not look much, but capturing an image of a fox for the first time was a very exciting moment and started me on a long journey into wildlife watching and photography. Over the following months we gained the confidence of one of the adults. This was mainly achieved by offering it small scraps of food which it would generally gather up and carry away. Looking back, we were doing this in the late spring which is precisely when adult foxes are busy feeding cubs. 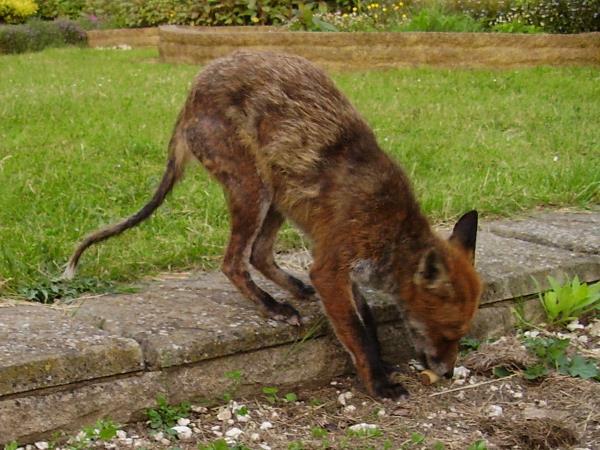 The fox was a scruffy thing and its coat was in pretty poor condition. That’s one of the reasons we were providing food, and no doubt also a reason it was taking it. We sought advice from a local wildlife centre and began a feeding programme of small amounts of dogfood and Vitapet, a cod liver oil skin conditioner. This more regular feeding was rewarded with more frequent visits and allowed me to start the collection of photographs in the 2005 galleries. Here he is fairly early on during the visits and you can see how poor he is looking. Some of this might be down to the annual moult. After several weeks things were improving. This gradual improvement in the condition of foxes over the summer months has become something with which we are now very familiar. This early encounter with a relatively confident fox set the seed for what is now approaching a decade of fox watching. During that time we’ve seen many fox cubs, encountered shy foxes and very bold ones, and treated numerous foxes for mange. We’ve had foxes that take to the rooftops, and others that were adept at climbing trees. For a more or less chronological record please visit the Complete Fox of the Day pages which at the time of writing (July 2014) contains around 3,200 photos.